Fact: I’m not a fan of chicken. This wasn’t always the case but as the years went by I grew to love chicken and this Brined Whole Chicken was part of the reason why. Growing up along the coastline of the Atlantic Ocean meant that seafood was a large part of our diet and believe it or not, it was cheaper to buy shrimp and fish than chicken. Chicken was considered a delicacy and I loved it. That was until I made the hop across the big ocean to NY City and ate chicken on a regular basis. I quickly began to dislike this bird that is the favorite of many. Ever notice when anyone is describing a mystery meat in a favorable way they always describe it as “tasting like chicken?” Well upon hearing that description I’m usually instantly turned off, that was until I started paying attention to the bird. Instead of tossing the bird on the fire with little care, I give it a lot of T.L.C. because I find that otherwise it is quite bland. 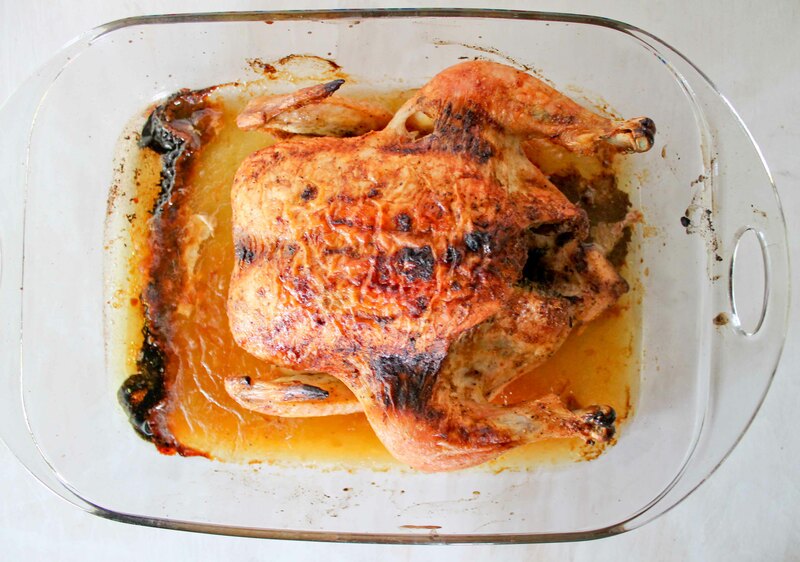 This brined whole chicken was given lots of love and it showed! I brined it overnight in a simple homemade brine. Don’t leave brining to just the holiday, it is easy enough to prepare on a weeknight and the results are always outstanding. I’ve used both fresh and dried herbs in the past and have had great results. It really is a simple process that produces very flavorful and juicy meat. The process of brining replaces the liquid in the chicken with all of the goodness of the brine. This means every bit of the meat is injected with all the flavors of the brine and as a bonus it’s extremely moist. Another added bonus is that brining provides lots of flavor without added fat. Brining truly has rekindled my relationship with chicken. To go with the brined whole chicken, I sautéed Chinese long Beans, also called snake beans or bora (Guyana) in garlic and butter. For those that haven’t had Chinese long beans, the flavor is similar to green beans but has a more chewy texture. As a child, we would pick these from the vines that grew along the fence and eat then raw with salt. Yes, we really did snack on raw vegetables. When cooking Chinese long beans, some prefer it barely cooked, while others prefer it cooked to death. I like it right in between, tender but still a bit firm. 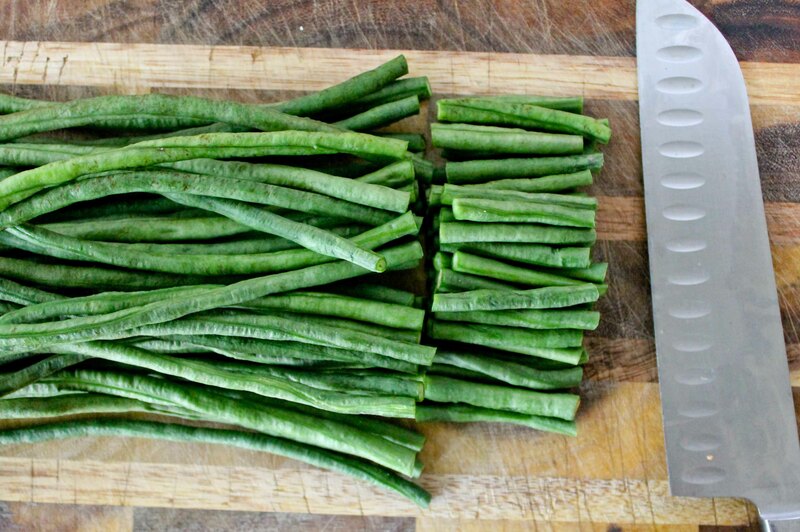 Chinese long beans, which are an excellent source of vitamins A and C, are a great addition to any stir-fry. 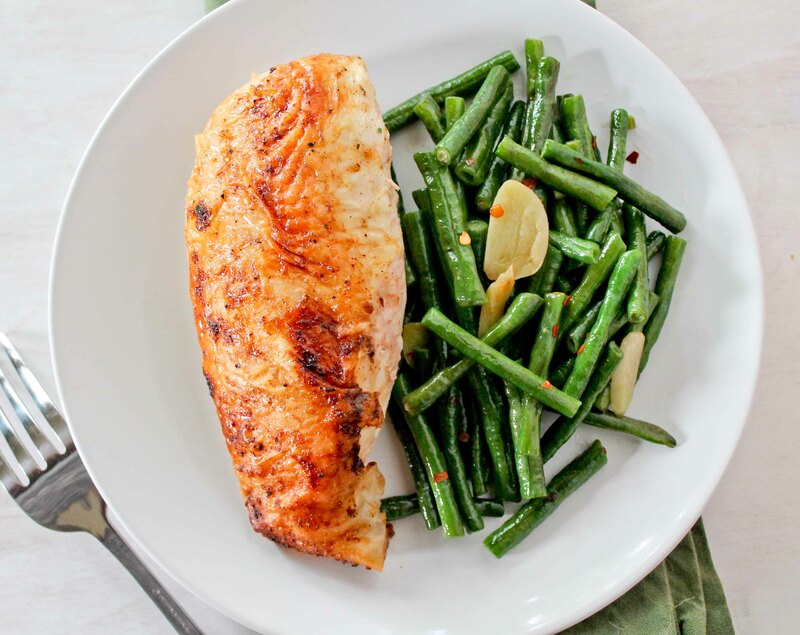 Try something different tonight as replace these with your green beans, you won’t be disappointed. Needless to say, neither the whole brined chicken nor the Chinese long beans lasted very long in my house. In a large bowl place cleaned chicken (remove giblets from cavity). Pour hot water in a bowl large enough to hold the chicken. Add onion, garlic, thyme, rosemary, black pepper, salt, sugar then stir until the sugar and salt have dissolved. Next add cold water then place cleaned, whole chicken (remove giblets from cavity) making sure that chicken is completely submerged. Cover with cling wrap and refrigerate. If the chicken floats place a weight such as a plate with a few soup cans on the top. Allow to sit for at least 12 hours but no more than 24 hours. After 12 hours, remove chicken from the fridge and discard the brine. Let the chicken sit until it comes to room temperature. In the meantime preheat oven to 425 degrees. Next in a small bowl, add salt, paprika, garlic powder and black pepper and stir to combine. Sprinkle on top and on the inside of the chicken with seasoning mix. Place in a large roaster pan breast side up and place into oven and bake for 1 ½ hour or until the juices run clear. Remove from oven and allow chicken to sit for 20 minutes before cutting. In a wide frying pan over medium heat add butter and canola oil. When the butter has melted add garlic and stir-fry until edges are lightly browned, about 2 minutes. Add Chinese long beans then stir fry for 5 minutes. Add chicken stock, salt and pepper then bring to a boil then cover frying pan and cook for 10-15 minutes or until tender and all liquid is gone. yayy! Congrats. That chicken looks yummy. Congrats Jehan! Really happy for you! Happy that you will represent us! Thank you Chef, I will do my best! Congrats! And that chicken looks divine! Thanks for dropping by my blog! This chicken recipe is a keeper!